Over the last century, education researchers have learned that education improvement is at least as much about public perceptions and politics as it is about science. Scholars have produced valuable knowledge about the normative and political dimensions of educating all in a diverse society, as well as about the technical and structural elements. The resulting research base is increasingly insightful and can help shape the public’s knowledge and the political environment within which decisions about policy and practice are made, as well as help improve and sustain practice. But, one other clear lesson from the past century is that the research base itself needs advocates; it will not be used unless it is thoughtfully promoted. Toward that end, the Knowledge Forum was designed to make visible and accessible to diverse policy communities high-quality education research that is relevant, powerful, and useful for addressing challenging issues in education. Held as part of AERA’s Centennial year program, the Knowledge Forum created an opportunity for leading education scholars and policy leaders from a range of sectors to engage in open, in-depth discussion of cutting-edge research on education and learning using Ed-Talks as catalysts for a series of compelling conversations. The Knowledge Forum is not only an important part of AERA's Centennial celebration, but demonstrates the association's vision of further connecting the science and scholarship of education research to policy and practice. A Scholars Retreat held October 1-4, 2015, in Santa Fe, N.M.
A February Forum held February 18, 2016, in Washington, D.C.
Five Presidential Symposia held April 9-12, 2016 at the AERA Annual Meeting in Washington, D.C.
Each of these events is further discussed below. The 32 scholars gather in Santa Fe, New Mexico for the Scholars Retreat. ​Thirty-two scholars were invited to a planning retreat held in Santa Fe, N.M., October 1-4, 2015. Each of the Knowledge Forum scholars had been nominated through an extensive open call for significant research, findings, and scholars notable for their own research and their comprehension of and openness to powerful research and innovative ideas. The retreat achieved two important goals. First, it provided a valuable opportunity for extensive exchange of ideas across areas of scholarship to strengthen the substantive design of the Forum plan. Second, it provided scholars with communications training to hone their presentation skills, including developing a TED-like talk. During the retreat, and with follow-up coaching, each scholar created a six-minute Ed-Talk that conveyed key research findings crisply, quickly, and in ways that were meant to be compelling to policy leaders about the value and relevance of education research. Sasha Barab (Arizona State University) presents his ED-Talk on February 18, 2016. ​On February 18, 2016, AERA convened the Knowledge Forum scholars and a complementary group of national thought and policy leaders at a forum in Washington, D.C. The February Forum was a “retreat-type” opportunity to examine the knowledge base and potential modes of knowledge utilization. This event featured 13 of the rapid-fire Ed-Talks on significant research clustered around three themes—how people learn, how we can optimize learning, and how we can foster equitable outcomes. Each cluster was followed by in-depth small group discussions, led by six other scholars, partnered with thought leaders, to consider the position and potential of research from the vantage of thought leaders’ roles and need. The Ed-Talks served to catalyze these compelling conversations. 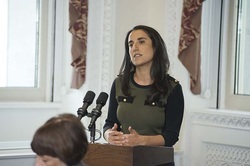 ​Held on the morning of February 19, 2016, the Domestic Policy Council (DPC) Roundtable featured Knowledge Forum scholars and high-ranking Obama administration officials meeting to engage together in “Bridging Education Policy and Research.” The DPC roundtable, held in the Old Executive Office Building, was hosted by Roberto Rodríguez, deputy assistant to the president for education. Building on the insights and conclusions from the first day of the Forum the roundtable featured scholar presentations and moderated discussions around three topics—New Designs for Learning and Innovation, Promoting Diversity and Conditions for Inclusive Learning, and Addressing Gaps in College Access and Success. Roundtable participants from the Obama administration included Ted Mitchell, under-secretary of the Department of Education; James Kvaal, deputy director of the Domestic Policy Council; Tom Kalil, deputy, director for technology and innovation at the White House Office of Science and Technology Policy; and several other officials representing the civil rights, P-12, and higher education areas of the Education Department and Domestic Policy Council. The DPC roundtable concluded with remarks from Kent McGuire, president of the Southern Education Roundtable, AERA Executive Director Felice Levine, and Roberto Rodríguez. Michelene Chi (Arizona State University) presents her ED-Talk at the 2016 Annual Meeting in Washington, DC. At the 2016 Annual Meeting, five Presidential sessions featured Ed-Talks delivered by 18 Knowledge Forum scholars. These sessions touched on major issues in education equity, the use of research in policymaking, student learning, opportunities for disadvantaged students, and inclusive education practices. Each of the five sessions included a policy and media person who reacted to the Ed-Talks. The policy commentators included Daniel Leeds (National Public Education Support Fund), Amanda Beaumont (U.S. Senate Committee on Health, Education, Labor, and Pensions), Raymond C. Hart (Council of Great City Schools), Brenda Calderon (National Council of La Raza), and Kevin Welner (National Education Policy Center). The media commentators included Sarah Dockery Sparks (Education Week), Jill Barshay (Hechinger Report), Emily Hanford (American RadioWorks), Dan Berrett (Chronicle of Higher Education), and Denise Harrington (DMH Consulting Group).